Whitley Bay almost pull a goal back against Anna Athletic as Ryan McGorrigan's effort is deflected beyond the far post. Less than 24 hours after their opening pre-season friendly at Dalbeattie, Whitley Bay made the short journey eastwards to take on Scottish League Two side Annan Athletic on Sunday afternoon. In addition to the players who had stayed overnight in Dumfries, Paddy Atkinson’s squad was strengthened with the addition of three of his summer signings, keeper Andy Jennison, midfielder Mark Bertram and winger Kris Hughes. Annan, an up and coming club who were only promoted to the Scottish League seven years ago, had narrowly missed out on the play-offs last season and this was the first time the sides had met. The game, played on Galabank’s all-weather surface, got under way during a heavy shower, making the pitch slippery. The hosts immediately went on the attack and Todd fired high and wide when well placed. Annan were gifted a sixth minute lead when Jennison failed to hold the ball from Peter Weatherson’s free kick, allowing it to fly out of his grasp into the net. The vastly experienced Weatherson, who started his career at now defunct Newcastle Blue Star, glanced a header beyond the far post three minutes later, but with 13 minutes on the clock, Whitley might have levelled when Bertram fired in a first time effort from 30 yards that whistled past the post after a Bay corner had not been cleared. Jennison made a fine save from Weatherson moments later but Whitley were gaining a foothold in the game and a flowing move involving Norris and Goss gave Peter Watling the chance to test Annan’s triallist keeper, who made a low save. Just past the half hour, Watling tried his luck with a 25-yard shot that left the keeper grasping at thin air as the ball flew just inches past the post. At the other end, Jennison did well to push a long range shot over the bar. Whitley began the second period well as the hosts failed to deal effectively with two free kicks, but they went two down after 52 minutes when a through ball was played beyond the Bay defence and Matty Flynn advanced before slotting it past Jennison. Shortly afterwards, Jennison made a great diving save to fingertip the ball away to deny Athletic a third goal. Kris Hughes was working hard both on the wing and equally in a more central role behind the strikers, while another to impress was Chris McDonald with an excellent work rate. On the hour Annan made five substitutions followed by three more not long after. 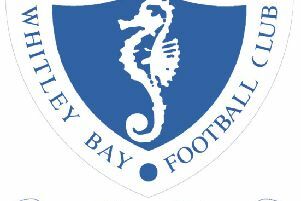 The combination of fresh legs and tiredness among some of those Bay players who had been involved in both weekend games gave the home side a distinct advantage in the final third of the game. But Whitley still created opportunities and they should have pulled a goal back after 76 minutes when Watling crossed from the left to put sub triallist Ryan McGorrigan through on goal, but he failed to capitalise and his effort was deflected past the far post. In the final ten minutes Annan got their third goal when a long ball over the top was not cut out and Rabin Omer managed to round Jennison to score. Whitley were up against a strong and fitter side whose season begins in just three weeks and who were obviously further advanced in their pre-season training. However, the weekend away proved to be a valuable fitness building and bonding experience, and with the likes of Alex Kempster, Scott Blandford and Steve Gibson all due to return shortly, as well as additional signings in the coming weeks, there is plenty for Atkinson and Paul Johnson to build on.